Funny, you just don’t hear I was married to a complete A**hole anymore. Why? Because the A**hole has been replaced by the Narcissist it seems. Narcissism is a personality disorder (NPD) which technically, can only be diagnosed by a psychiatrist. But with the power of the internet we can all identify signs and symptoms of Narcissism at our fingertips. We already know what an a**hole is, right? So, let’s find out what a Narc is…we’re curious. We begin reading and watching youtube videos on the subject and voila, we’re convinced our Ex really is a Narcissist and maybe he IS. In fact, your ex may very well be a Narc but be careful in self diagnosing and labeling your ex, especially on social media and if you’re a blogger. I’m not saying this to minimize your experience with your ex in any way. Rather, I write this in hopes to better understand the differences and the similarities between Narcs and a**holes or even alcoholics and abusers. “Narcissism, in lay terms, basically means that a person is totally absorbed in self. The extreme narcissist is the center of his own universe. To an extreme narcissist, people are things to be used. It usually starts with a significant emotional wound or a series of them culminating in a major trauma of separation/attachment. “No matter how socially skilled an extreme narcissist is, he/she has a major attachment dysfunction. The extreme narcissist is frozen in childhood. He/she became emotionally stuck at the time of his/her major trauma of separation/attachment.”- How to Spot a Narcissist by Samuel Lopez de Victoria, Ph.D. The Narcissist is incapable of intimacy, remorse or deep feeling. Loving a Narcissist is like pouring all of your affection into a funnel and watching it fall out the bottom. No matter how much you do for them, they will not appreciate or notice. They only notice when you stop ‘doing’ for them. The people closest to the Narcissist are simply a reflection of himself. His image is EVERYTHING. -the a**hole is capable of true intimacy once they let their guard down. Something to consider here is we are all capable and probably have been an a**hole at one time or another. The time you finally spoke your mind and told your best friend what you really thought OR the time you made a joke that was just a little too cutting…yes, these are a**holey things to do and often we regret them almost immediately. 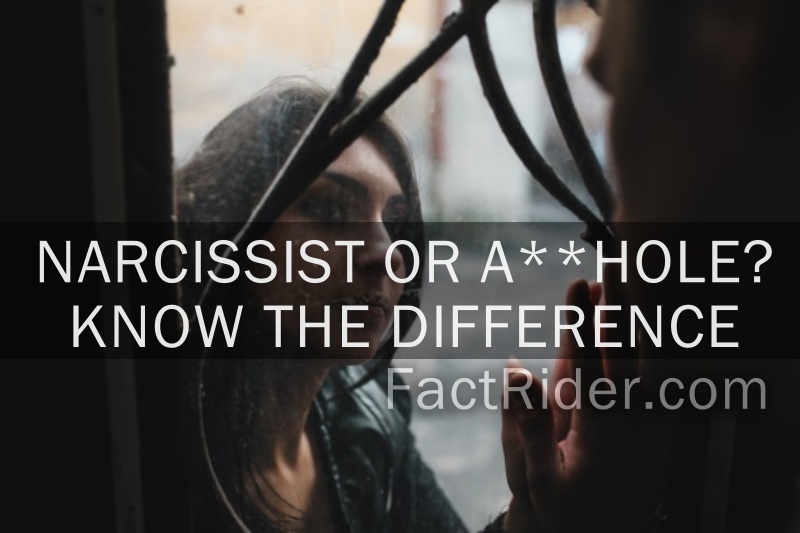 However, it is unlikely that we all have been narcissists at one time or another. Narcissism being a disorder and condition that cannot be overcome easily. Gaslighting is when the Narc falsely convinces the victim that they are defective . For example, the Narc might say “It’s too bad you don’t get along well with people because if you did we would have more friends.” This is a mental type of abuse that if continued over a long period of time takes away the victim’s self confidence and sense of reality. Apologies come fast and furious with a**holes. They usually have the common sense to know when they have made mistakes or hurt someone and they will follow up with an apology. The problem? They usually repeat the mistakes and continue in their a**hole ways. There’s a saying if you’re in a room with more than 10 people and there isn’t an a**hole in sight? You’re the a**hole. Well, I don’t necessarily believe that but it is a funny statement on the fact that there is usually one a**hole in a crowd. Narcissists on the other hand, never admit wrong doing. It is absolutely beyond their comprehension that they may have hurt someone or done wrong. They blame the victim every time. They make an excuse every time. 3. Narcs know what they want and how to get it. Rules don’t apply to Narcs. A**holes understand the difference between right and wrong. 4. Narcs never go too far to get what they want. A**holes know when to quit. They are capable of knowing when they’ve gone too far. 5. Narcs are among the most charming people you will ever meet. A**holes are not charming. 6. Narcs are superficial. A**holes have deep thoughts and analytic capability. 7. Narcs play the role of ‘victim’. A**holes rarely act like victims. 8. Narcs are habitual liars, twisting facts to suit their reputation. A**holes don’t habitually lie to get their way. 9. Narcs are socially insatiable. They can never get enough attention. A**holes often enjoy time alone and don’t feel insecure about their solitude. Gee, the A**hole is beginning to sound like Prince Charming…but I’m not suggesting that A**holes NEVER lie, act like a victim or USE people only that if and when they do it’s with a conscience and with some remorse. I think it’s easy to confuse an alcoholic or a physical abuser as a Narcissist. Yet those problems do not automatically define the person as a Narcissist. Alcoholics have some similar characteristics and personality traits. They put their drug of choice before everyone and everything. It is the ultimate in selfishness. They can lie and charm to get their drug or next drink. A physical abuser is often a victim of physical abuse himself and is using his learned technique to take control of a situation or person. That does not make him a true Narcissist. Physical abusers typically show and experience remorse. Narcissists are NOT able to feel remorse. If you were married to a Narcissist who physically abused you, and was an alcoholic? You suffered the ultimate terror. It couldn’t possibly get any worse short of losing your life to that person–you could write a book, no doubt. -all signs taken from Nina Brown’s Children of the Self Absorbed: A grownup’s Guide to Getting over Narcissistic Parents. When you read the personality traits of a narcissist you realize what a serious disorder this truly is. That is why it’s important not to mislabel, or self diagnose. Remember there are varying degrees of Narcissism. Some are more extreme and dangerous. Any form of narcissistic abuse is very damaging. If you were married to a Narcissist or have a relationship with a Narc in any capacity, you are a victim. It is important to understand the best methods to protect yourself. Some people have ongoing relationships with Narcs while many discontinue any connection with them. Finding what works best for you and your situation is key as well as educating yourself on the disorder. But before we announce to the world “I was married to a Narcissist.” Make sure you know the difference between a full fledged Narcissist and a run of the mill A**hole. Also? Be careful not to confuse alcoholism or an abuser with a Narcissist. I hope this helps you decipher and give some more thought to who your ex really is and what makes him so freakin’ hard to deal with! BTW, yes women can be Narcissist as well, obviously.